Sasayama"- Little Kyoto" SUBPAGE | All Japan Kyoto Association"
Sasayama has long been an area where people’s lives developed since the ancient and medieval times along with agriculture and Buddhist culture. Around the early 16th century, the Hanano Clan ruled over the area with Yagami Castle as their stronghold, however, they were defeated by troops led by Mitsuhide Akechi in 1579. Later, the first Tokugawa Shogun undertook full-scale maintenance throughout the country and Sasayama Castle was built in 1609. The town was successfully developed around the castle and became a rich cultural and economic center. In 1609, the first Tokugawa Shogun, Ieyasu, established a castle on the hill called Sasayama in order to have a base from which to seize Osaka Castle. 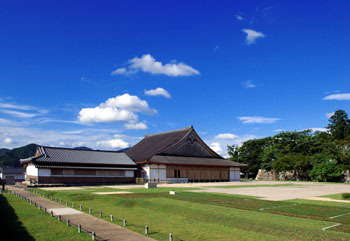 The construction took only six months and this is the origin of Sasayama Castle. The castle remained in the area for 335 years until it burnt down in a big fire in 1944. About 50 years later, the Oshoin room which used to be in the Ninomaru building of Sasayama Castle was recreated. Traditional castle structures and elaborate decorations have all been restored and once again present the gorgeous atmosphere of when the castle flourished. This was a second residence of the Aoyama Family who ruled over the Sasayama domain in the Edo period. A number of historical assets and documents from the Edo period (17-19th cenutry) are displayed such as the Nagaya-mon Gate, woodblocks used for printing the books of Chinese study (rare examples of such kinds), Nezumi Soshi picture scrolls, and so on. 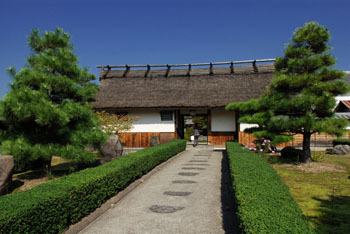 This is a typical example of liegeman’s residence who served the Aoyama Clan, the samurai retainer who governed the Sasayama domain. Inside displays dishes and furniture which the Anma Family used in their daily life. 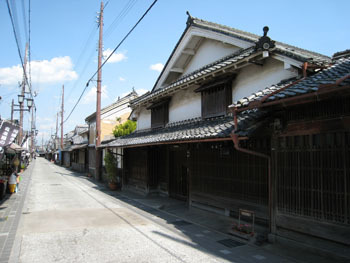 Traditional Tsumairi-style merchant houses, which have a narrow entrance and a deep interior, stand along the street for about 600 meters. This is the Traditional Buildings Preservation District where classical Japanese architectural designs such as wooden lattice walls, earthen walls and pillars tell of the atmosphere of olden times. Ojiyama is a small hill located in the eastern part of the Sasayama Castle Ruins. 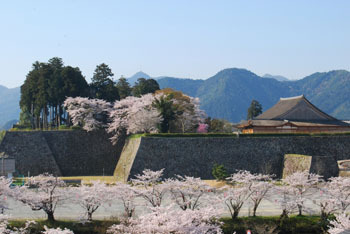 Ojiyama literally means the “Site of Kings” since it was chosen as one of the candidate sites for settling the national capital before the Heian period. Plum and cherry blossoms in spring and colored leaves in autumn welcome visitors. There is a small shrine named Makekirai Inari with a legend from the Edo period where many students come and pray for their academic success. 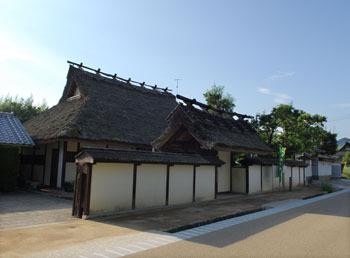 The samurai governor, Tadanaga Aoyama, donated this outdoor stage for Noh theatre plays in 1861. 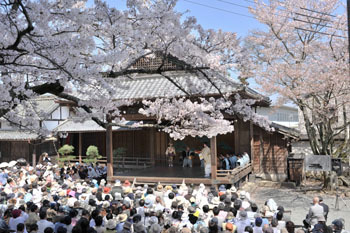 It was the largest Noh stage in western Japan at that time. After over 200 years, people perform Noh and Kyogen pieces on the stage twice a year, “Okina” on New Year’s Day and “Kasuga” in spring. The old wooden building of a former law court built in 1891 has been renovated into a museum. 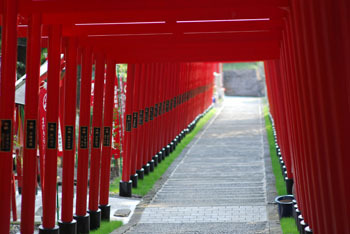 A number of local art pieces from Sasayama are exhibited. 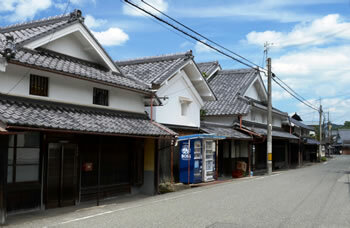 Fukusumi district was the second Traditional Buildings Preservation District in Sasayama castle town. It is located by the Saikyo Kaido old highway which connected Sasayama and Kyoto in the Edo period (17-19th century). 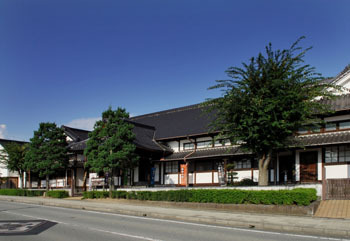 The historical townscape still retains the Edo-period atmosphere when many accommodations opened their doors to travelers. Shakunage, or Alpine Rose, is praised as the “King of Plants” as its flowers are just gorgeous. 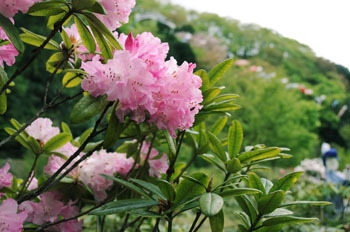 This is an event at which people can enjoy the beauty of Alpine Rose under the pleasant spring sky. 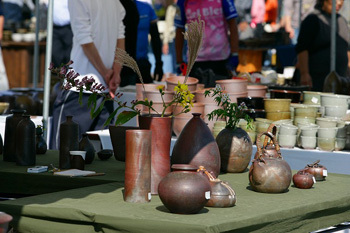 Exhibit and sale of both Japanese and Western Alpine Roses, a contest, and lectures about how to grow Alpine Roses are held. 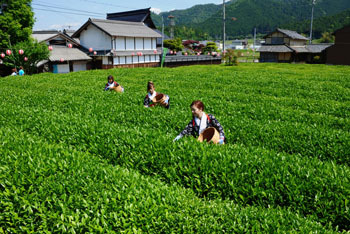 Ajima Oku district of Sasayama is the only Japanese green tea production area in Hyogo Prefecture. Chanting by Buddhist monks, tea ceremony of sencha (brewed tea) and matcha, sampling of the newly produced tea of the year and many other tea-related events will be held. 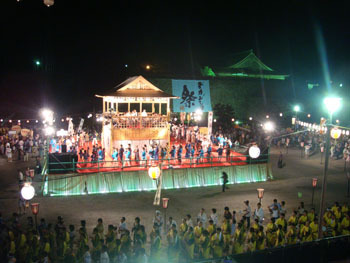 Dekansho Festival is the most famous summer event in Tanba Sasayama and features Japanese folk songs. People dance along to the folk songs around the largest wooden tower in Japan. Everyone is welcome to join in. Autumn in Tanba Sasayama is a treasure house of seasonal specialties: Tanba Sasayama black beans, Tanba chestnuts, and a number of local delicious items will be sold and eat-in spaces will also be available. Tanba Traditional Craft Park “Tachikui Sue-no Sato,” Konda Branch of Sasayama City Hall, Hyogo Ceramic Museum, and each potter’s kiln. Visitors can enjoy the Tanba-yaki Ceramic Market and food stalls presenting an ample variety of autumn delicacies of Tanba Sasayama. Enjoy both art and delicious food items from Sasayama. 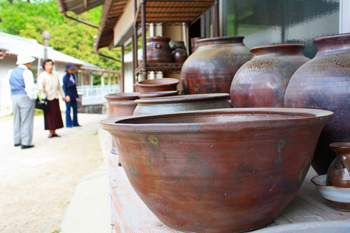 Tanba-yaki Ceramic is one of the six greatest ceramic kilns in Japan along with Seto, Tokoname, Shigaraki, Bizen, and Echizen. Its history is said to date back from around the Heian period (794-1185) to the beginning of the Kamakura period (end of 12th century). Continuing the tradition for 800 years, Tanba-yaki is a favorite ceramic style for many people due to its simple and warm touch. In 1818, Tadahiro Aoyama, the samurai governor at that time, brought a skilled ceramic artist, Kamesuke Kinkodo, from Kyoto to Ojiyama and let him start producing ceramics. 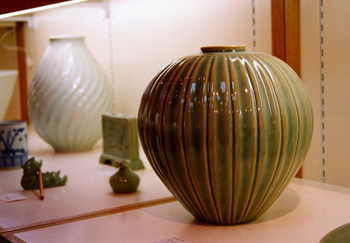 The kiln was closed at the beginning of the Meiji period (1868-1912) but was revived in 1988. A Toji is a specialist of sake brewing. Tanba Toji are regarded as one of the three most skilled Toji in Japan along with Nanbu Toji (Iwate Prefecture) and Echigo Toji (Niigata Prefecture). 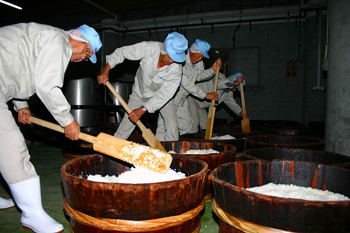 The prominent skills of sake brewing have been passed down for over 300 years. Sasayama has been a production area of high quality cotton since the early 18th century. People spin and weave fabrics from the cotton. 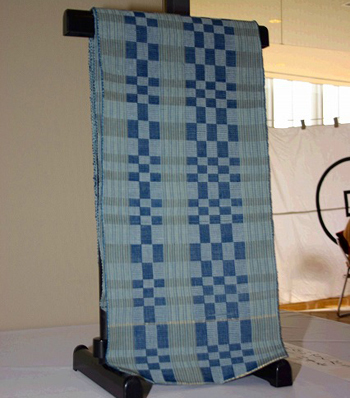 Today the cotton fabric, Tanba Momen, has been selected as the traditional craft of Hyogo Prefecture as well as a rare kind of traditional craft. 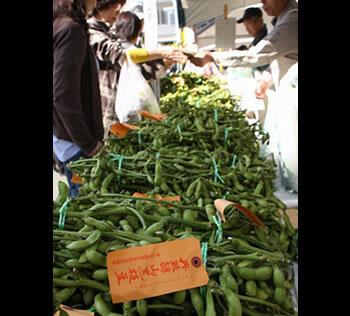 Tanba Sasayama Black Soy Beans are shiny and larger than the ordinary kind of soy beans and are often used in New Year’s dishes. 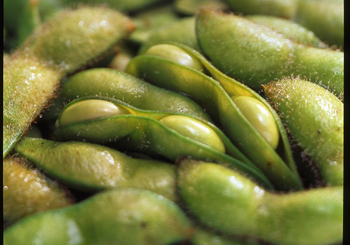 The Tanba Sasayama Black Edamame can be enjoyed for only two weeks from early October. A number of people visit Sasayama to try this special delicacy. Yama-no Imo (a kind of taro) raised by the natural climate and soil of Sasayama is extremely sticky and tasty when eaten in a broth. 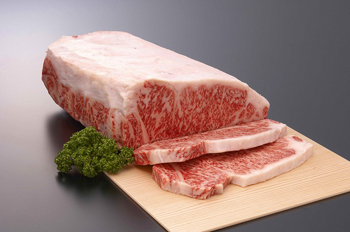 Raised in the fine natural environment of Sasayama, Tanba Sasayama Beef is regarded as the most luxurious beef in Japan. It is the home of Kobe Beef, one of the three best Japanese beefs. Savor the quality umami of beautifully marbled meat. Due to the geographical situation of a large temperature gap between day and night and rich water resources, Sasayama grows excellent quality rice. 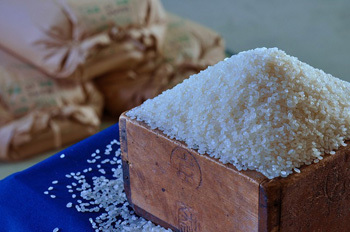 It is often considered the best rice in Western Japan. Matsutake is the king of Japanese mushroom and the matsutake from Tanba are regarded as the King of Kings. 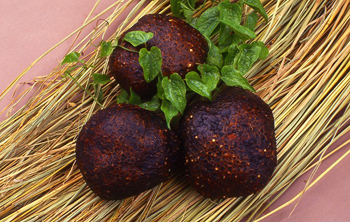 Their shape, rich fragrance and texture are all the very best. 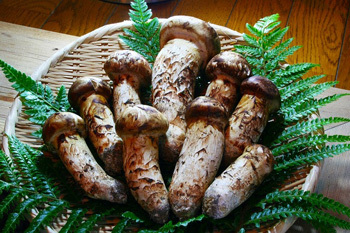 Since the harvesting quantity has been decreasing in recent years, Tanba Matsutake is becoming more and more valued. 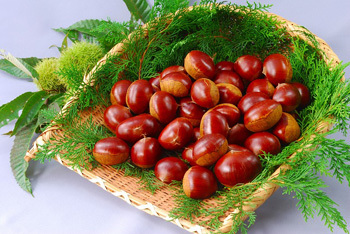 Chestnuts harvested in Tanba have long been claimed to be the best in Japan. They were often offered to the Shogun in the Edo period (17-19th century). Groups of daimyo lords always purchased chestnuts in Tanba whenever they travelled near Sasayama and brought them back to their area. As a result, the name and delicious taste of Tanba chestnuts spread throughout Japan. 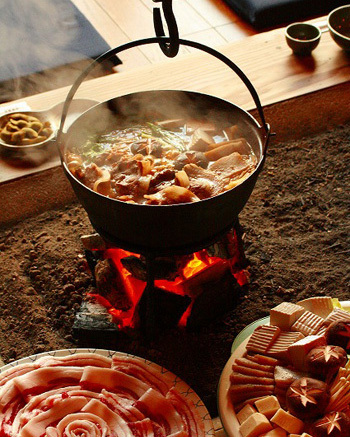 Botan-nabe is a hot pot dish using wild boar meat that originated in Sasayama in the Meiji period (1868-1912). Botan-nabe in the Takirenzan area is claimed to be the best in Japan. It is a special local dish in winter and has been selected as the “100 Best Local Dishes in the Villages of Japan” by the Ministry of Agriculture, Forestry and Fisheries of Japan. 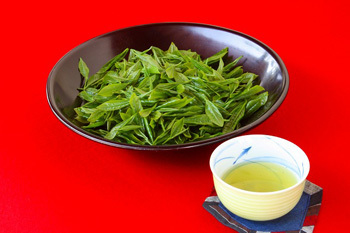 The origin of Tanba Tea goes back many years. An historical record written about 1200 years ago mentions that people planted Japanese tea trees in Tanba. Since tea was a main agricultural product of Sasayama, they sold a large quantity of tea leaves to Osaka and it was an important source of income for the domain. According to the historical record from the 19th century, half of the tea leaves consumed in Osaka at that time were from Tanba. Koshi Hikari rice from Sasayama, meat (Sasayama beef, wild boar, deer, chicken), and root vegetables are all together in one savory rice bowl. 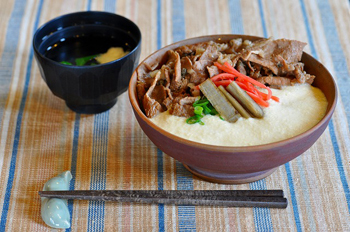 Many restaurants in town serve their unique style rice bowls using local delicacies.